South African prosecutors have temporarily withdrawn murder charges against the 270 miners accused Thursday of killing 34 striking colleagues shot dead by police at the platinum miner Lonmin's (LON:JSE) Marikana mine, but warned they could be recharged when inquiries were complete. 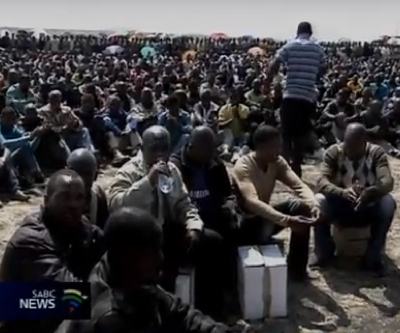 According to the BBC, Nomqcobo Jiba, the acting director of public prosecutions, said all detained miners would be freed with a warning, providing police could verify their home addresses. Sunday's announcement comes as a result of increasing criticism from political parties, trade unions, civil society and legal experts. In a news conference held Sunday, the National Union of Metal Workers called for the suspension of the police task force "that executed the Marikana massacre." The union's central committee "calls on the commission to find out and make public who, between the minister of police and the national police commissioner, gave orders to shoot workers with live bullets when they peacefully assembled on that fateful mountain," the union's secretary general Irvin Jim was quoted as saying by The Citizen. Talks to resolve the dispute continue at the mine, which has been shut for the past three weeks.